TEMPORARILY OUT OF STOCK. MORE DUE IN THE WEEK OF 25 FEBRUARY. ORDER ONLINE TO GET PRIORITY PURCHASE. 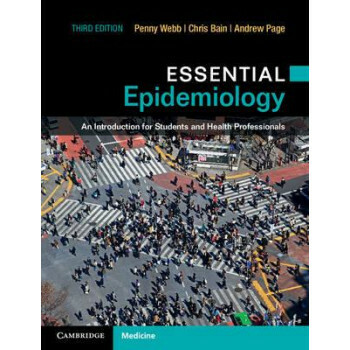 Taking a practical approach and supported by global examples from all areas of health, the new edition of this popular and highly commended textbook has been updated to reflect current epidemiological thinking and teaching. Based on feedback from teachers and students, material has been reordered to better suit courses and reflect the underlying logic and purpose of epidemiology. * Provides students with a rounded picture of the field by emphasizing the commonalities across different areas of epidemiology, including clinical epidemiology, and highlighting the key role of epidemiology in public health * Avoids complex mathematics by restricting this to optional material, thereby keeping the book accessible to students from non-quantitative backgrounds * Integrated and supplementary questions help students to reinforce concepts * A wealth of online material is available at www.cambridge.org/essential_epidemiology, including additional questions, advanced material for key concepts, recommendations for further reading, links to useful websites and slides for teaching, supporting both students and teachers.